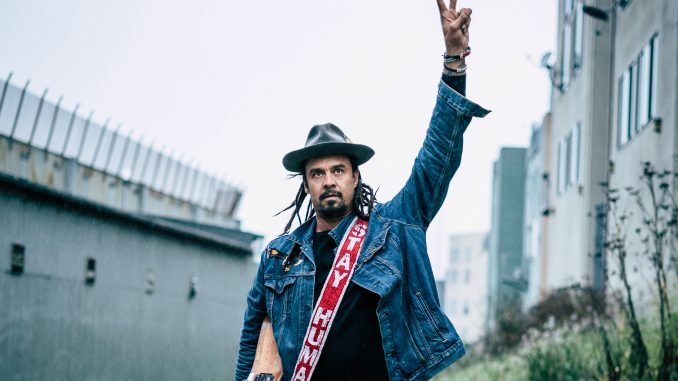 Critically acclaimed singer/songwriter Michael Franti and his band Spearhead are set to release their new album, Stay Human Vol. II, via Thirty Tigers in the UK on 15 February. In celebration of the upcoming record, Franti is now premiering the track ‘Nobody Cries Alone’ with XS Noize. Franti will make a series of special intimate appearances throughout the western U.S. this fall at screenings of Stay Human. Each screening will feature an introduction by and Q&A with Franti, as well as an acoustic performance by Franti accompanied by Carl Young (bass, vocals) and Victoria Canal (keys, vocals). UK screenings are currently being arranged for early 2019. Franti released his first self-directed documentary, I Know I’m Not Alone, in 2005 to widespread critical acclaim. The film depicts his mission for peace in the Middle East, with a focus on the human cost of war. Franti visited war zones in Iraq, Israel and Palestine again finding a common connection, playing music to both soldiers and civilians regardless of affiliation. Michael Franti & Spearhead continue to foster the community both on and off stage and with Michael and his wife Sara’s foundation Do It For The Love, a wish-granting nonprofit that brings those with life-threatening illnesses, veterans and children with severe challenges to concerts. His recent musical projects have included the Billboard #1 single “The Sound of Sunshine” (2010) and full-length releases All the People (2013) and SOULROCKER (2016), which topped the Billboard rock album charts at #4 and #5, respectively. Pre-orders of the album at come with instant downloads of the album tracks “Just To Say I Love You,” “Stay Human 2” and “Flower In The Gun” and are available at http://smarturl.it/StayHumanV2.